Good morning!! I hope you all have had an amazing school year so far!! We had a great 2018 Season, finishing as STATE CHAMPIONS!!!! I'm so proud of the young ladies and so excited for the future of this program. Please see the printable form or click on the link below to register for camp this summer!! We are holding camp for incoming 2nd-6th graders, May 28th - 31st, at Shadow Ridge Middle School. If younger, please ask as we love to help as many as we can! We are holding camp for incoming 8th-9th graders, July 22nd - 25th. Team camp will be that week in the afternoon - at least that is what we are working on. Incoming freshmen are encouraged to come to the incoming 8th-9th grade camp, as well as the Team Camp! Please let me know if you have any questions! We are SOOOOOO EXCITED about camp!! Check back soon for more information and volunteer opportunities! Thank You and Congratulations - Booster Club Board Officer Transition! Go Jags, 2019 Journey begins! 11-17-18 Flower Mound Jaguars 2018 6A State Champions!!! 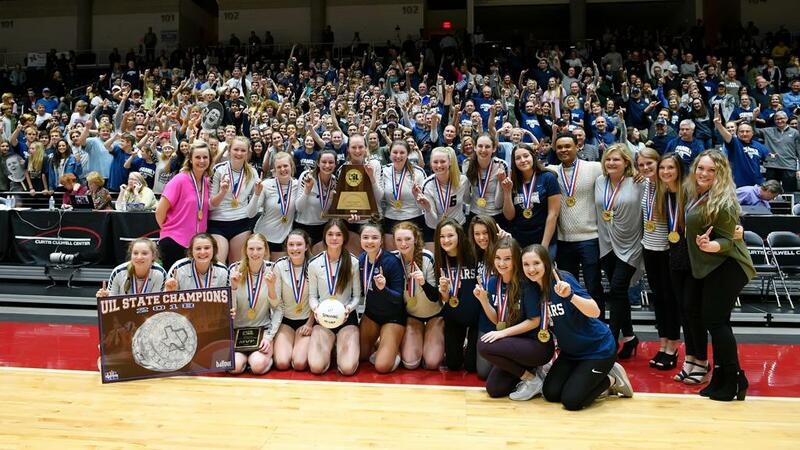 Tonight Flower Mound Jaguars beat Fort Bend Ridge Point 3-1 (24-26, 25-21, 26-24, 25-22) to take the 2018 UIL 6A State Volleyball Champions Title! We could not be more proud! Our fans have been an amazing cheering section on this journey....thank you, thank you, thank you! 2018 Jaguar Volleyball 6A State Champions T-Shirt Online Purchase for Pick-Up Thursday 12/13! Purchase your Jaguar Volleyball 6A 2018 State Champions t-shirt online and pick it up on Thursday December 13th in the Arena at 3:30pm! 11-10-18 Jaguars Beat Southlake Carroll to Win the Regional Finals!! 11/9/18 Jaguar Volleyball Beats El Paso Coronado in the Regional Semifinals! 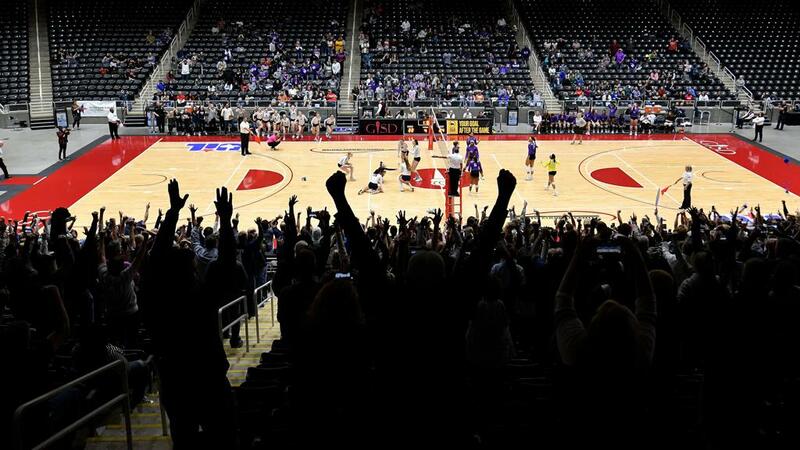 Thank you to all the fans who came to tonight's late Regional Semifinals to cheer our Varsity on bringing home the big win against El Paso Coronado! Our Lady Jags advance to the Regional Finals tomorrow, Saturday 11/10 against Southlake Carroll at 1pm playing again at the W.G. Thomas Coliseum. Jags bring your friends as we need you all to come out Loud and Proud tomorrow! It will be a battle on the court and with cheering fans! 11/9/18 Jaguars Beat El Paso Coronado in the Regional Semi-Finals! 11/5/18 Jaguars Beat No 1 Ranked Byron Nelson in Regional Quarterfinals! What a night for Jaguar Volleyball beating Texas No. 1 Ranked Byron Nelson in the Regional Quarterfinals tonight! Both teams true competitors with hard fought finish in Game 5 with Jaguars winning 15-13...we are so proud of you all! Jaguar Volleyball Finishes Regular Season Jaguar Strong! Freshmen Navy ends the season 23-2 overall and 12-1 in district!!! We are so proud of you!!!!! The future is bright!! Dig Pink Breast Cancer Fundraiser - THANK YOU!! Jaguar Volleyball is excited to be supporting the Side-Out Foundation and it's Dig Pink initiative this year! We raised $554.40 for Side-Out to go toward a clinical trial specifically for patients with stage 4 breast cancer, the most advanced form of the disease and the least funded area of research. Our fellow Football Jaguar family joined us in this fight adding another $260! We had a great night last Friday with our "Dig Pink Games" at home against Hebron! Thank you to all the fans who joined us wearing their pink and cheering on the Jags to victory! Jaguar Volleyball Congratulates JV2, FN and FS - ALL Tournament Champions ! Jaguar Volleyball could not be more proud of our Champion Winning Teams this past Saturday 9/15! JV2 are Champions of the Annual CFB JV Tournament hosted at Newman Smith High School! Freshman Navy are Champions of the Annual Wylie Freshman A Tournament hosted at Wylie High School! Freshman Silver are Champions of the Annual Wylie Freshman B Tournament hosted at Wylie High School! Thank you to our Varsity and JV players and parents who did an amazing job on Saturday 9/15 hosting the Annual LISD Middle School 8th Grade Tournament. Congratulations to the Champions McKamy Middle School! JV2 - Champions of Annual CFB JV Tournament hosted at Newman Smith HS! Freshman Navy - Champions of Annual Wylie Freshman A Tournament! Freshman Silver - Champions of Annual Wylie Freshman B Tournanament! Click on the the direct link to see incredible Jaguar Volleyball action shots taken by photographer Joe Lorenzini. It will update for all our teams as the season progresses so check regularly! Thank You to All Our Jaguar Volleyball Fundraiser Supporters! Thank You for each and every donation given to our Jaguar Volleyball Fundraiser! We are all so thankful for the support towards the upgrading of equipment, arena costs, travel costs and uniforms. Our players did a wonderful job reaching out and sharing our story. Go Jags!! Players refer to your direct team text communications on practice schedules and any changes to games or tournament schedules. Players and Parents please select from the "Teams" drop down above your team and then select "Game Schedule". Any game changes will be communicated by your daughters coach, directly to the players. 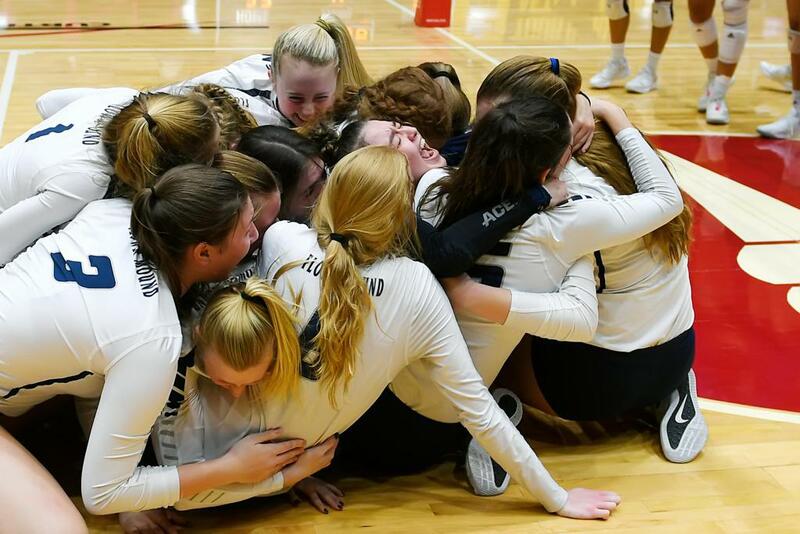 Please review weekly my Jaguar Volleyball Family Newsletter and check regularly here on the FMHS Volleyball website and/or twitter for any program updates. 2018 Jag Bash Grass Volleyball - THANK YOU & Picture Link! THANK YOU to all our Players, Volunteers, cheering Fans and our SPONSORS for making Saturday another awesome Jag Bash Grass Volleyball Event! Please watch the video below, if you need a refresher course on how to keep the score book. Reminder this year the players will be doing libero tracker form. If you have any questions, please see one of the coaches. Thanks for all you do! Please watch this Volleyball Scoring video, if you have any questions please see one of the coaches! Thank you for all you do! 2018 Jaguar Volleyball Sponsors - THANK YOU! 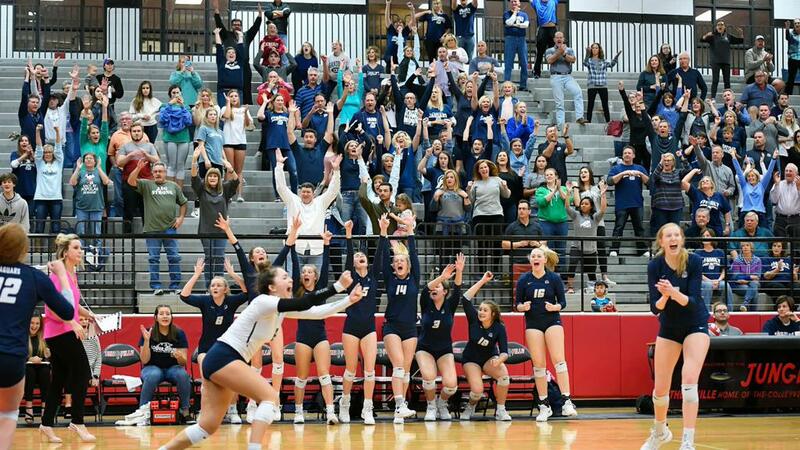 ©2019 Flower Mound Lady Jags Volleyball / SportsEngine. All Rights Reserved.